First, let's start by making a copy of the library we will be modifying. This way, if any mistakes are made we will not run the risk of damaging our Primary Library. 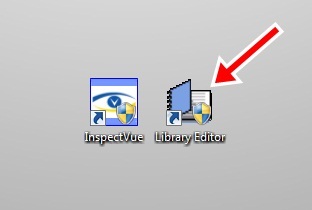 To do this, we need to open the Library Editor. 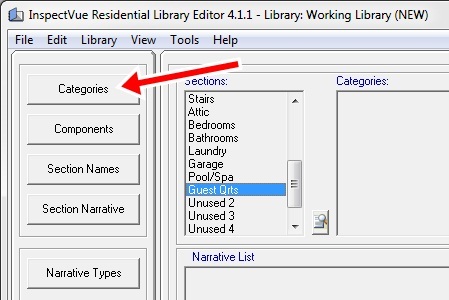 Once the Editor is opened, click on "Library" at the top and select "Add Library". 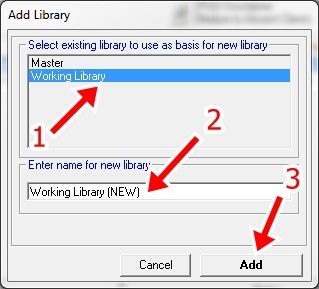 Select the Primary Library you normally use. Enter a NEW name. 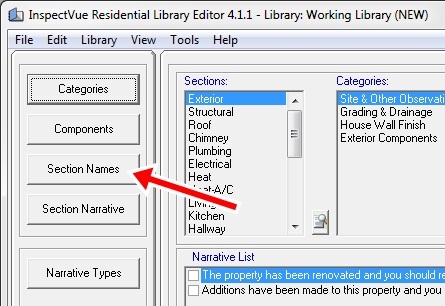 (In this example I just added (NEW) to the end of the original library name). You should be in your NEW library now. You can verify this by glancing at the top window border. It should tell you the library you are working with. 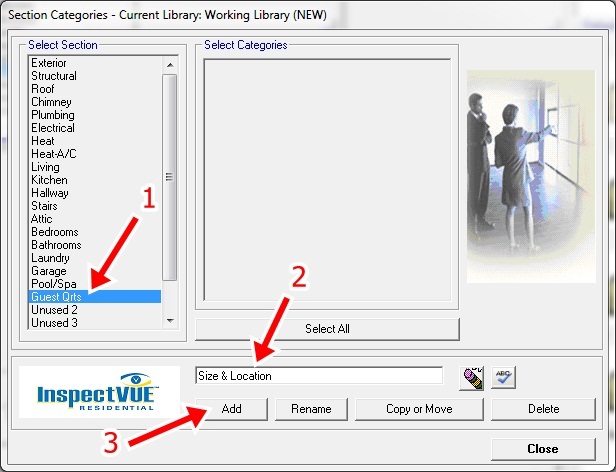 In this case, it's Working Library (NEW), then select "Section Names". Find the first "Unused" Section name. In the example to the left, I am using "Unused 1". You may or may not have this one available. If not, simply located the next available "Unused" section name slot and rename it to whatever you desire. Note: the number of characters is limited so you may have to abbreviate your section name. Not to worry, we will correct this later so your Section Name appears as you wish. 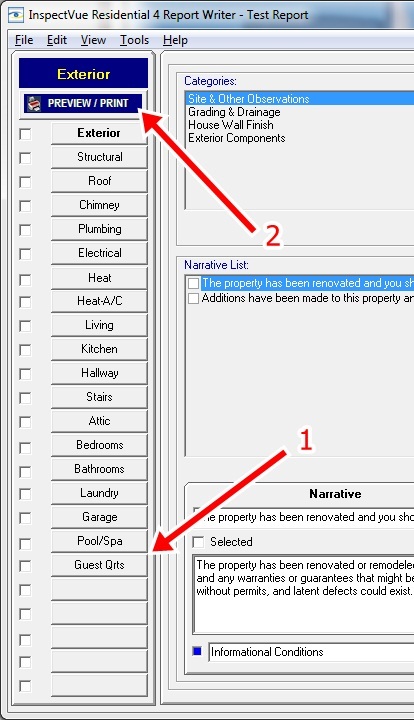 In this example, I named my section: "Guest Qrts"
Once your Section Name is as you like it, click "Save Changes"
By scrolling down in the "Sections" window, you will find that your new Section is now available. 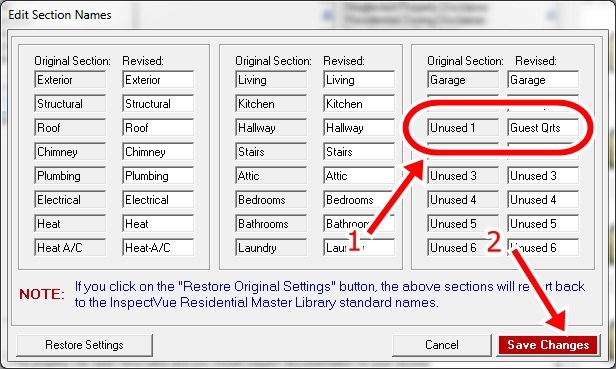 Note: Your new section will stake the place of whatever "Unused" section you changed in the previous step. Its position in the Section List cannot be changed. 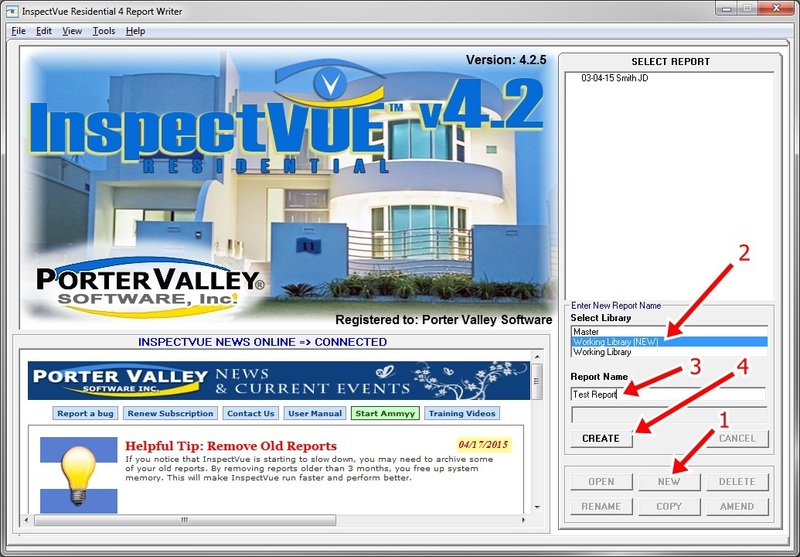 You can however, change is position on the printed report and will be covered in a later step. 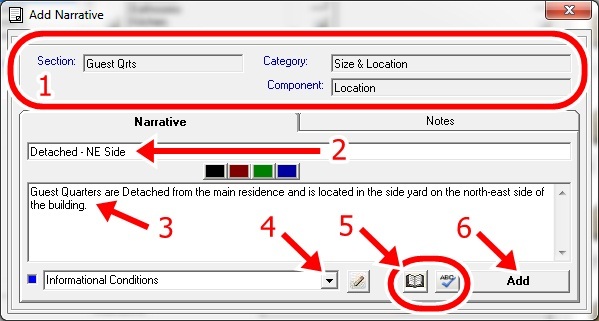 Next, click on "Section Narrative"
This step is Optional but is reccomended as all other Sections have a General Narrative. When satisfied, click "Save Changes"
Now we will need to click on the "Categories" button. Ensure you have your new Section selected. Continue to add new Categories until you are satisfied with the result. 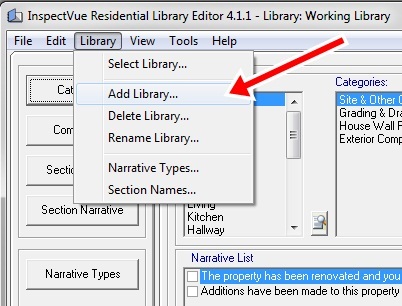 Note: You can return at anytime to add more, Delete, Copy, Move, or Rename existing Categories. Note: These Category Names are only for reference purposes only. Your names may vary. Next, Select the Category you wish to add Components to. Continue adding Components until you are satisfied. 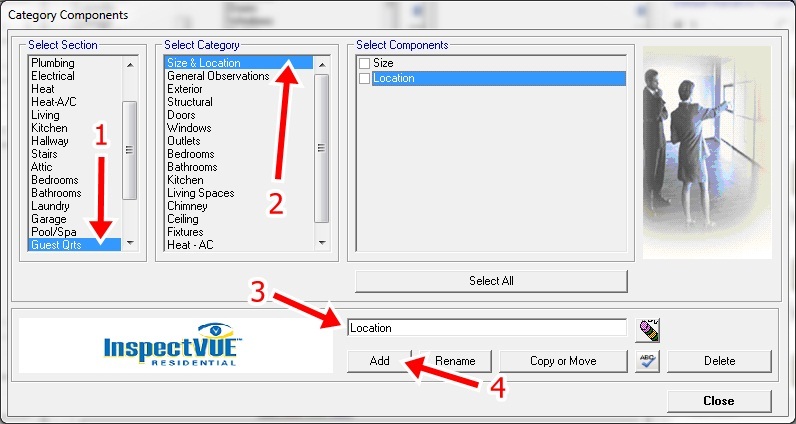 You can return at anytime to add more, Delete, Copy, Move, or Rename existing Components. Double check your Section, Category, and Component are correct. Important! 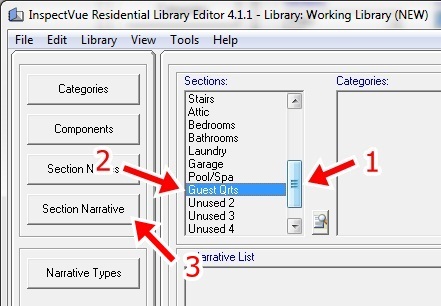 Do not forget to set the Narrative Type by clicking the dropdown button. Its a good idea to get into the habit of Spell Checking Narratives. Click on "Add" when finished. 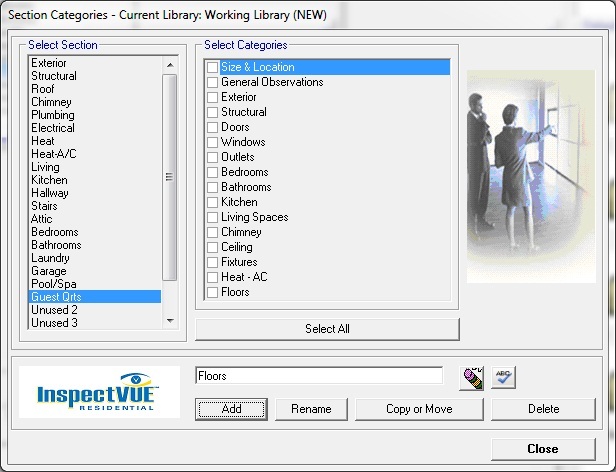 You can use these blue, up and down arrows to order your Categories, Components, and Narratives in a manner that best suits your inspection style. Take a quick moment to double check your Narrative names are logical and descriptive. Continue adding Narratives for all your newly added Components. When satisfied, Close the Library Editor. Name the report "Test Report" or something similar. 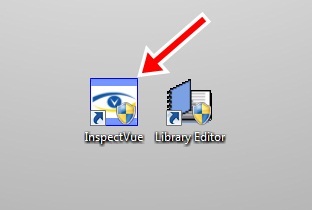 Ensure that the correct library is displayed here. 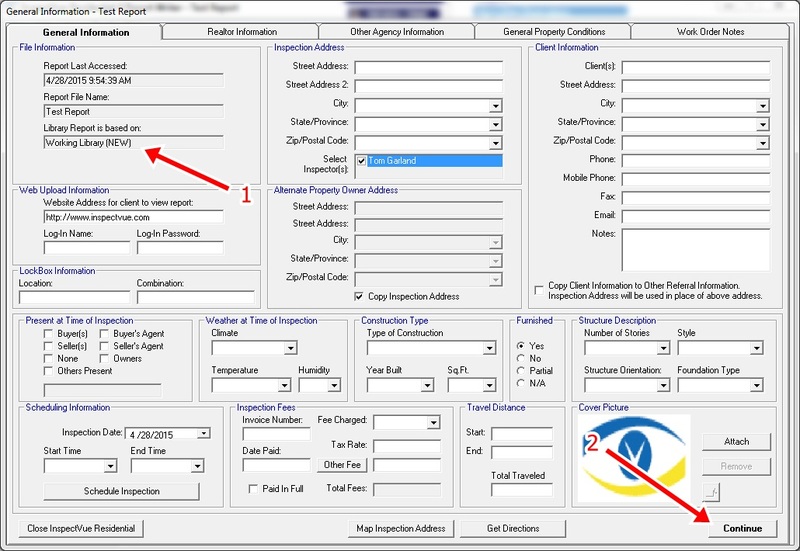 As this is just a Test Report, it is not necessary to fill out any of the data on the General Information page. 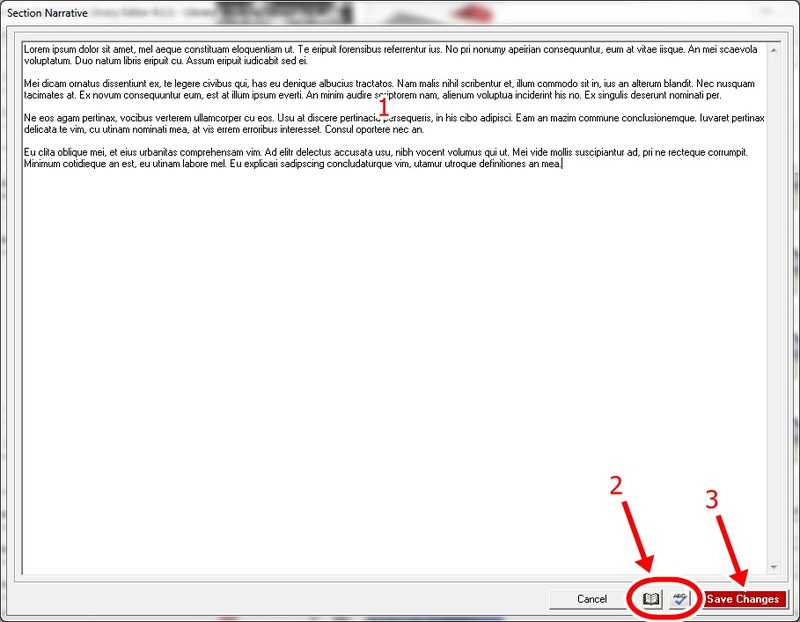 Click "Continue"
As you can see, our new section is showing up, but it is not displaying in an easy to read format. Let's change that. Click on the "General Print Options" button. Make it look Professional - Click left image to enlarge. Find the newly added Section and edit the right hand field. 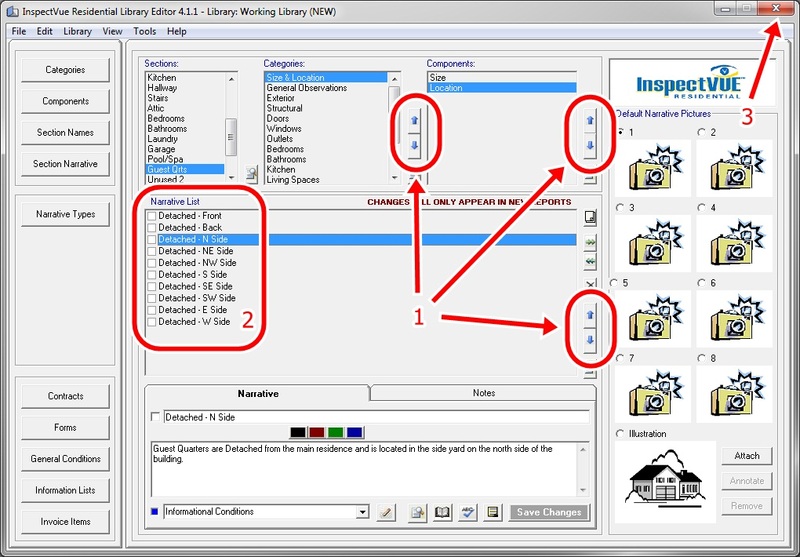 ... and use these blue, up and down arrows to change the Print order of the Sections. 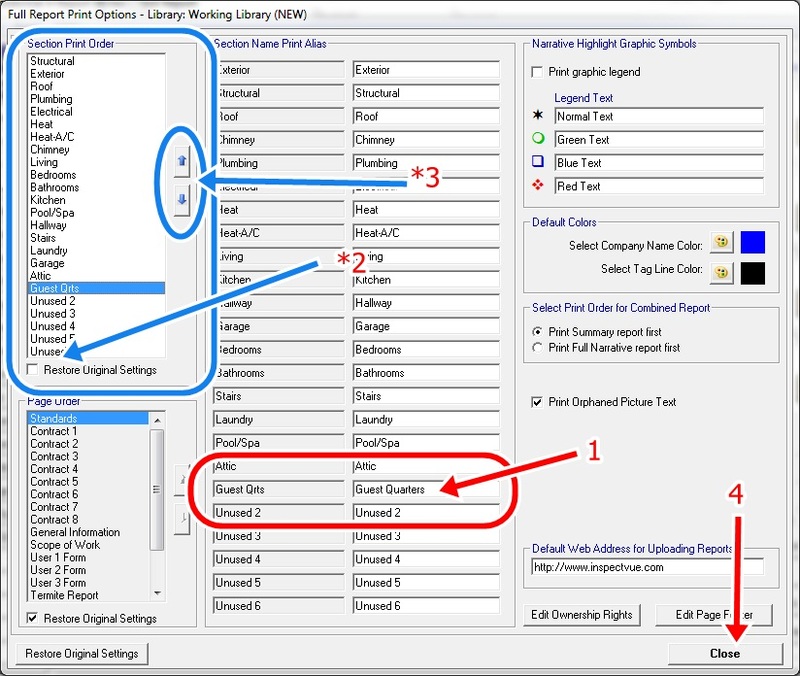 Please keep in mind that this will not change the Display order within the Software. When satisfied, click "Close" amd you are done. All future reports made with this Library will reflect the changes. Although, technically at this point we are done, I want to encourage you to back up your new Library. You never know when distaster will strike.